Today we celebrate the feast of the Exaltation – or Triumph – of the Holy Cross. In the year 313, the Emperor Constantine signed the Edict of Milan, which proclaimed toleration for the Christian faith within the Roman Empire. Constantine’s mother, Helena, made a pilgrimage to the Holy Land, and with the support of the local bishop – excavated the area known as the site of Golgotha. Tradition states that portions of the true Cross, with a partial nameplate still attached was found, resulting in Constantine ordering that the Church of the Holy Sepulcher be built over the site. The church was dedicated nine years later, with a portion of the Cross placed inside it. So the feast that we celebrate today marks the dedication of the Church of the Holy Sepulcher in the year 335. That Church was unfortunately destroyed by the Muslims in the year 1009, only to be rebuilt centuries later, with the new occupants – all Christians – vying for control of the site! Unfortunately even among our brother Christian Churches there have been numerous clashes and conflicts over the control of this holy site. It is as if all of us – as guardians of the Church’s holiest site – had not internalized the meaning of the true Cross – the meaning of what happened on that site 2000 years ago – the meaning of the Father’s supreme sacrifice of His Son for the sake of His creation. God’s love was raised up on Golgotha that day and Satan’s venom was forever neutralized, but the sting of Satan’s original bite in the Garden of Eden still remains. The truth of our Scripture readings tell us that Moses lifted up the bronze serpent, a sign of sin, and the people were healed. Jesus makes an analogy of the serpent with the healing power of the Cross – since it is a sign of our sin and our redemption. When the Father, through the Holy Spirit, lifted up Jesus in the resurrection, the Holy Cross was no longer viewed as a sign of evil and sin – rather it became a sign of Christ’s victory and our salvation. Our Savior, through the instrument of the Holy Cross, shows us the level of His love for His creation. The Father shows His love for us by giving us the best He has – His Son – and His Son shows His obedience and trust in the Father – through His willingness to take upon Himself all sin and become a perfect offering back to the Father on our behalf. 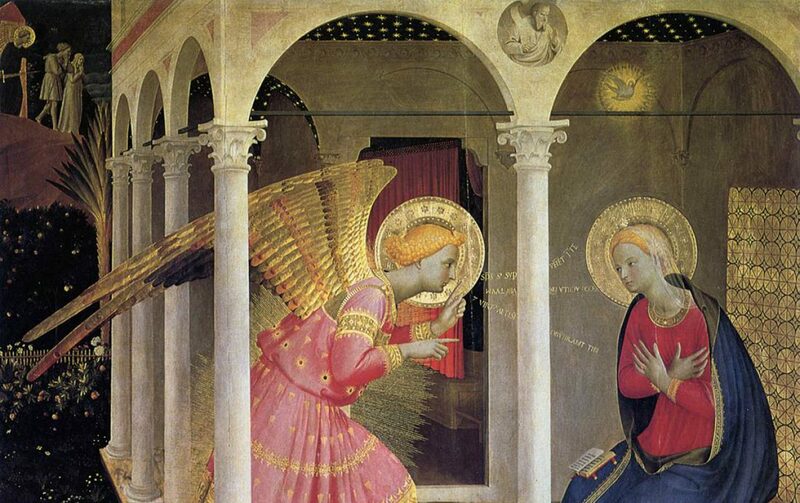 The Fra Angelico Institute for the Sacred Arts chaplain, Fr. Joseph Upton, gave a beautiful homily today at morning Mass in which he emphasized that every day, we too raise up Jesus on the Cross. In every Mass, we have re-presented the sacrifice of Jesus for us. We commemorate His act and we thank Him for it in His gift of Himself to us in the Eucharist. We unite ourselves to the Triumph of the Cross through the Mass. As sacred artists, on a daily basis, we must attempt to imitate this profound love of God in our creation of artistic works, and in our families and community. Our love must be strengthened by the truth of our faith – and by the triumph of the Cross; when we do this we will understand that the crosses that we carry, and the sufferings that we endure, unite us to the Lord, and help us transform our lives into His. Our Blessed Mother is our model for this transformation. Tomorrow, September 15th, is the memorial of Our Lady of Sorrows. The Invitatory prayer that begins the Office of Readings in the Liturgy of the Hours says, “Let us adore Christ, the Savior of the world, who called his mother to share in his passion.” Those words reminded me of a beautiful illuminated miniature by Jed Gibbons, a very fine artist from Chicago. I met Jed when he was teaching at the St. Michael’s Institute for the Sacred Arts at Enders Island in Mystic, CT. Jed has produced some truly inspirational work (his Stations of the Cross in the chapel on Enders Island are exquisite) and this piece that you see below captures not only the theme of the Triumph of the Cross but the truth of the Church’s teaching that Mary shared in the passion of her Son. This piece is entitled Maria, Mater Misericordiae (Mary, Mother of Mercy); it was completed in 2006, and was done in historic earth pigments and 23 karat gold. It measures 6.75 by 9.25 inches. I thank the Foundation for the Sacred Arts website for the image. This image is beautiful. Thank for sharing. Blessings, Daniel.